PAN India 3G Service Provider and National Telecom backbone Bharat Sanchar Nigam Limited (BSNL), has announced the launch of 3G/2G Prepaid Unlimited Internet (Data) STVs for GSM Mobile users as a promotional offer for customers in Haryana and Himachal Pradesh telecom circles only. The newly announced unlimited prepaid data STVs offer Unlimited Mobile Internet with post FUP (Fair Usage Policy) speed of 80Kbps. BSNL is the only Telecom Company in India which is offering world class telecom services to the people of India at lowest and affordable charges. BSNL announced two new unlimited prepaid data STVs with FUP. They are : 1) Data STV worth Rs 241 with 1 GB high speed 3G data, and 2) Data STV worth Rs 351 with 2 GB high speed 3G data. Both these STVs got validity of 28 days. After the FUP limit, customers can enjoy unlimited mobile internet @ 80kbps as Free without any extra / additional charges. This is really a great offer from BSNL for it's Prepaid Mobile customers in Haryana and Himachal Pradesh circles. As we reported earlier, Mobile data consumption is increasing exponentially in India and these type of Unlimited Data STVs are the need of the hour. BSNL already launched Unlimited 3G Data Plans for BSNL Postpaid customers across north and south zones in India. Now, these Unlimited 3G mobile data STVs were introduced as a promotional offer for 90 Days from the date of launch for BSNL Prepaid Mobile customers in Haryana and Himachal Pradesh telecom circles. We may expect the same offer to be launched in all other BSNL circles across India. 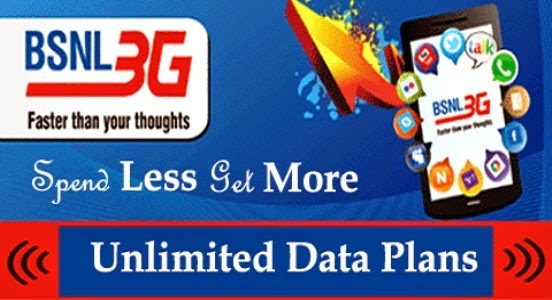 Unlimited 3G Data offers from BSNL are the most economical offers in the market and these are well suited for heavy data usage-always online customers. Dear readers, please share your vies and opinions about these Prepaid Unlimited 3G Data STVs from BSNL via comments with us. Please introduce Unlimited 3G data stvs for Kerala circle. Yes, We too need unlimited data packs. please start these offers in kerala.